The sugar refinery of businessman and philanthropist Conrad Finzel dominated the centre of Bristol in the 19th century, until the late 1870s, on the site now being redeveloped as Finzel’s Reach. Sugar refining was among the most significant industries in Bristol in the 18th and 19th centuries, but Bristol Museums & Galleries has little in the way of artefacts in its collections to reflect this. Finzel made a major contribution to the technology of the industry and ran the largest refinery in the city. His philanthropic work included supporting the Muller Orphanage. 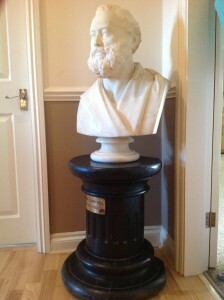 This large bust was carved by ‘G. Papworth of London’ in 1856 and stands on an oak pedestal, made from timber reclaimed from the 17th century Fourteen Stars tavern demolished to make way for the refinery. Edgar George Papworth Senior (1809-1866) and Edgar George Papworth Junior (1832-1927) were both sculptors and it is unclear which may have carved this bust as both were active at the time. Both exhibited at the Royal Academy, Papworth Junior exhibiting over 50 sculptures between 1852 and 1832. Papworth Senior was a pupil of Edward Hodges Baily, sculptor of Eve at the Fountain (displayed in Bristol Museum & Art Gallery) and of Nelson on Nelson’s Column in London. The bust, once displayed at the Colston Hall, came into the hands of the then landlord of the Shakespeare in Totterdown, at which pub it resided from the mid 1980s until 1999. During its time there the bust acquired a new life, known to a generation of customers as ‘Ed’ and was dressed according to the season. Bristol Museums, Galleries & Archives are delighted to have been offered the opportunity to add the bust to the city’s collections and are grateful to the vendor and both the Friends of Bristol Museums, Galleries & Archives and the Friends of Bristol Art Gallery who have shared the £2750 cost of acquisition. The intention is to display the bust in M Shed where its 19th century and more contemporary history will be interpreted for visitors.